With its intuitive frontend and backend options it is very easy to create a unique web page. The drag & drop system make this page builder plugin an easy-to-use solution for all users regardless of their skill level as designers or developers. On the other hand developers will find this plugin useful because they can assign this plugin to their templates with their own shortcodes and enable their potential users to design their own web pages using template’s elements. By simply dragging and dropping elements on the stage you can add all the content that you need regardless of the template that you are using. As you are adding or editing elements to your webpage you are actually modifying your website live. You can hide controls at any time to get the same “feeling” as a visitor. All of the elements that you can add on the page have tons of options that you can use to “fine-tune” a specific element or the entire web page. 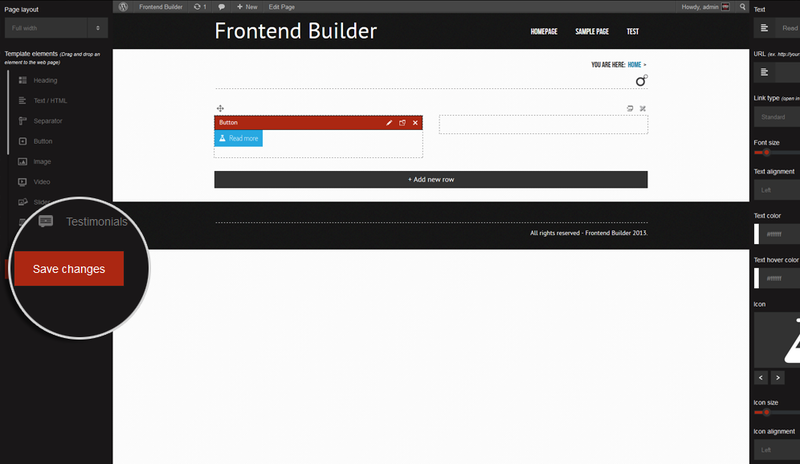 Every element in our WordPress Frontend Builder can be cloned and then dragged to a different position. This option saves a lot of time. 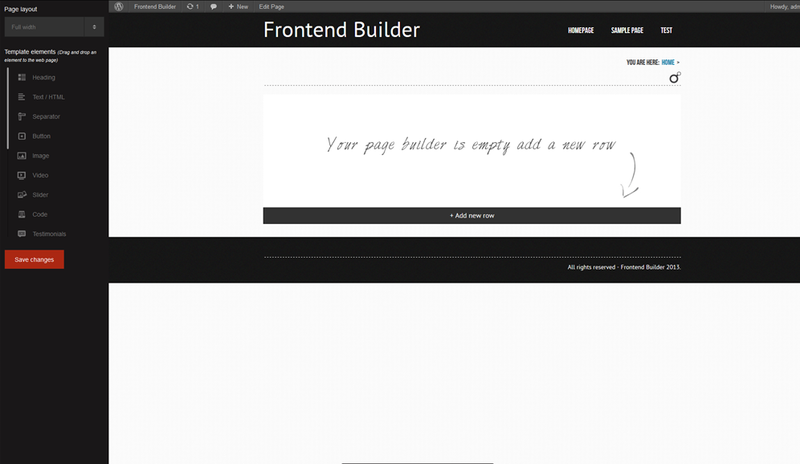 Frontend page builder uses wordpress shortcodes as display functions. There is no need to modify your theme. Just map them and your good to go. Every control is at your disposal. Each control has multiple parameters to best suit the attribute you want to use it on. Responsive dimensions and margins are changeable. Some or all default shortcodes can be removed. New shortcodes can be included. No unnecessary scripts are included. Frontend editing is done virtually, on the separate page from the one used as a display. Each of these elements have 5-20 options for setup so the number of variations is huge. Displays an image to your web page. The options for editing text styles can be found in the backend of the WordPress Frontend Builder “Wordpress menu > Frontend builder > Typography options”. Frontend settings: Insert URL to the image or upload an image, image description, text alignment, insert link, link type (new tab or lightbox), choose the hover icon, bottom margin, round edges, add bottom border, choose the colors for border, border hover, description text, description text hover, description background and description background hover. Display a YouTube, Vimeo or any other video clip. Insert a slider into your web page. It can be used to display a classic image slider or it can display a Text/HTML versions. Tons of options are included along with the option for vertical sliding of elements. Title, icon and text. Used to display features, services or options for your website. The options for editing text styles can be found in the backend of the WordPress Frontend Builder “Wordpress menu > Frontend builder > Typography options”. Frontend settings: Title, icon, content, link, set the order of items inside this element, set the style to clean, rounded or squared, bottom margin, title size, icon size, title color, icon color, text color, background color, title hover color, icon hover color, text hover color, background hover color. You have tons of options for setting up your button just the way you like it. The options for editing text styles can be found in the backend of the WordPress Frontend Builder “Wordpress menu > Frontend builder > Typography options”. Frontend settings: Text, URL, link type (new tab or lightbox), font size, text alignment, colors for text and text hover, insert icon (font awesome icons), icon size, icon alignment, bottom margin, full width, roundness, fill/border, background color, background hover color. Tons of options for displaying a testimonial on your web page. The options for editing text styles can be found in the backend of the WordPress Frontend Builder “Wordpress menu > Frontend builder > Typography options”. Frontend settings: Name, profession, quote, URL (if you want to link the testimonial), insert thumbnail (80×80px), choose between 3 styles: clean, squared, rounded, bottom margin, name color, quote text color, main color, background color. Heading element displays your heading style. It is generaly used for titles but you can use it how you see it fit. The options for editing your heading styles can be found in the backend of the WordPress Frontend Builder “Wordpress menu > Frontend builder > Typography options”. Here you can set different fonts, styles, sizes and line heights for each of the 6 heading styles. 630+ Google fonts are supported. Displays an alert box into your webpage. You can choose between 4 styles or you can set it up yourself. The options for editing text styles can be found in the backend of the WordPress Frontend Builder “Wordpress menu > Frontend builder > Typography options”. 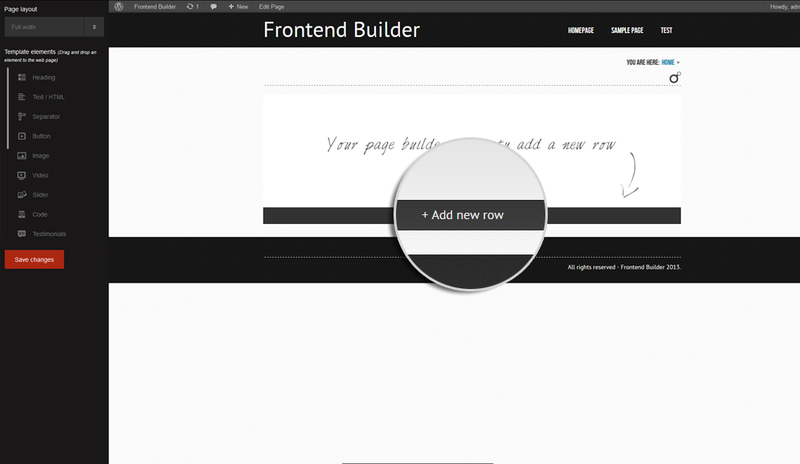 Design your tabs just the way you want them with tons of options inside our Frontend Builder. The options for editing text styles can be found in the backend of the WordPress Frontend Builder “Wordpress menu > Frontend builder > Typography options”. Accordion menu is an excellent content display element allowing you to display large amount of content without overloading your page. The options for editing text styles can be found in the backend of the WordPress Frontend Builder “Wordpress menu > Frontend builder > Typography options”. Frontend settings: Add new element, set the active state, title, content, image for each element, set the style, bottom margin, title color, text color, trigger color, main color, background color, border color for the entire accordion. Insert a search box into your web page. There are tons of options for editing this element. The options for editing text styles can be found in the backend of the WordPress Frontend Builder “Wordpress menu > Frontend builder > Typography options”. Frontend settings: Set text inside the box, bottom margin, round edges, set colors for text, border, background, text focus, border focus, background focus. 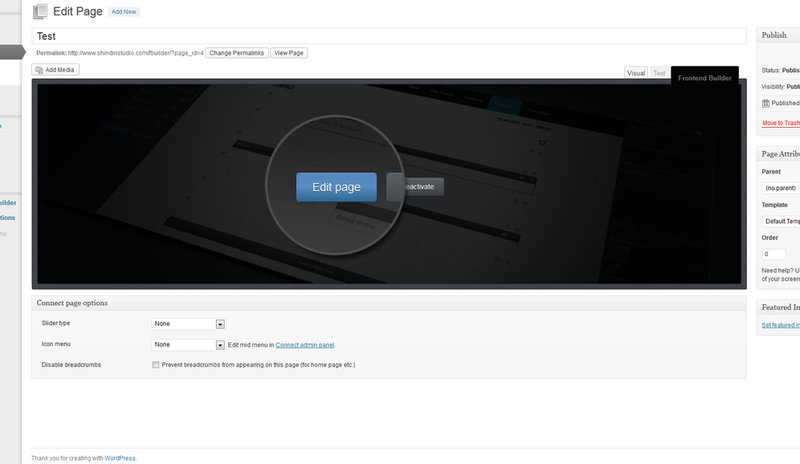 Frontend settings: Insert text / HTML, option to format new lines, text alignment, bottom margin. Create a unique icon menu that perfectly suits your needs. Frontend settings: Add, order or delete menu items, choose icon, URL and link type for each item, set bottom margin, icon alignment, icons size, round edges, colors for: icons, background, icon hover, background hover. Insert a standard separator in a form of a line. It has 4 default styling options. Displays a code area. The styling for this element is pulled directly from the template that you have installed and activated. Displays a featured post element. All you need to do is to import one of your posts into it. The options for editing text styles can be found in the backend of the WordPress Frontend Builder “Wordpress menu > Frontend builder > Typography options”. Frontend settings: Select a post from your archive, set the hover icon, button text, element style: clean, rounded or squared; bottom margin, colors for background, border, button, button text, button hover, button text hover, heading, meta links, meta hover and text. 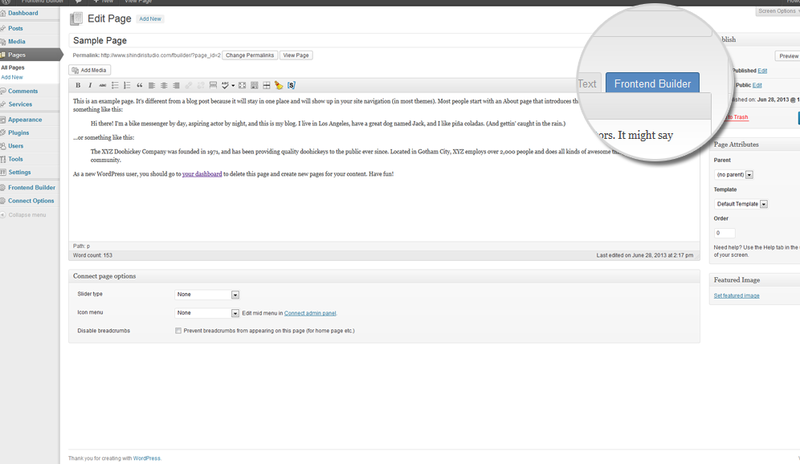 Displays a nav menu from WordPress. The options for editing text styles can be found in the backend of the WordPress Frontend Builder “Wordpress menu > Frontend builder > Typography options”. 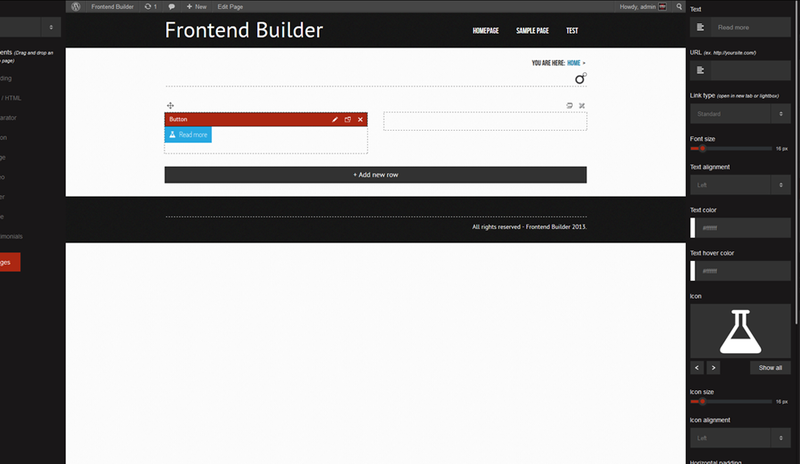 - Builder is now compatible with modern admin plugin.